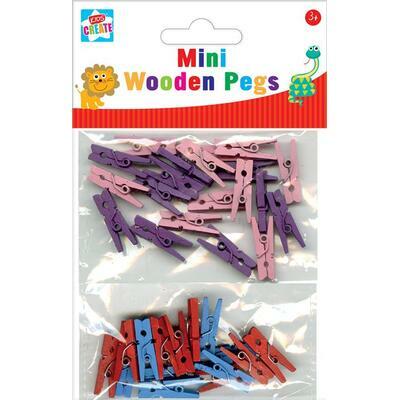 A great and versatile resource for a wide range of environments, add these Coloured Mini Wooden Pegs to your basket today. Each one has been manufactured from a lightweight and durable wood. This allows them to work perfectly with a range of adhesives - ideal for card crafts or other collaging projects. Alternatively, they can be used to hang small items such as cards or miniature items of work to display lines. This large pack of 40 wooden pegs slips easily into your craft kit, regardless of whether you plan sessions for the old or young. Dimensions- 25 x 8 x 3mm each. Here at Gompels, we have a wide range of Arts and Crafts resources for all environments. From protective Aprons and Table Cloths through to Painting Accessories and Glues & Adhesives, you'll find everything you need right here at exceptional wholesale prices.